The Mark Morris Dance Group offers Dance for PD classes as a key component of the educational outreach activities when on tour to cities around the world. Dance for PD classes often take place in tandem with MMDG performances, and incorporate movement phrases from the repertory being performed in each city. Since 2007, MMDG has offered Dance for PD classes in Boston, Washington D.C., Seattle, Berkeley, Oakland, London, Toronto, Louisville, Ann Arbor, Champaign-Urbana, Phoenix, San Francisco, Auckland (NZ), Edinburgh, Tel Aviv, and Macau, among others. 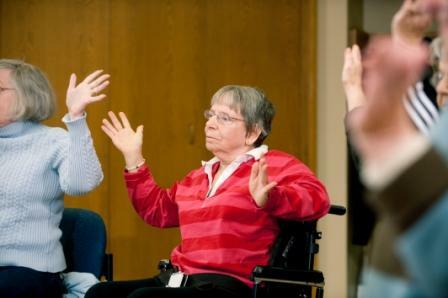 Such medical centers as Evergreen Hospital (Seattle), Jewish Hospital/Frazier Rehabilitation Institute (Louisville), Carle Hospital (Champaign-Urbana) and Beth Israel Deaconess (Boston) have hosted Dance for PD demonstration classes in their facilities. Online registration is available for certain classes. Please click below to see the complete list of classes on the road, and to register, or call 1-800-957-1046. All classes are presented by MMDG and BPG, in association with the listed collaborators, and are offered free of charge to participants, their caregivers, partners, spouses and friends. Community Classes on the road are made possible, in part, by the Stanley J. Wertheimer Community Master Class Fund. To inquire about sponsoring a Dance for PD Community Master Class in your community, please contact us.